Detailed information and the recommendations for Slovenia’s attractive destinations, cuisine, hotels and shopping options. The essence of Europe, Slovenia is defined as “the sunny face of the Alps” by its people. You know it deserves its epithet at first sight of the country. The fields are green and vast, the lakes and the rivers are refreshing and peaceful and the mountains are venerable. You feel the nature’s peace and you feel the relief when you feel Slovenia. Slovenia is one of the countries in Europe that the nature is alive and in the urban life. Do not get surprised if you see the traffic signs saying “beware of the bear”. Although it is a small country, you discover that nature behaved generously to this country. When Bled Lake fascinates you with its admirable location, Postojna Cave thrills you to the bone and the capital Ljubljana will make you feel the real Slovenia. Tourism revenues play the biggest role in the income pie of the country thanks to the fabulous nature, hot springs and worldwide famous casinos. Ski resorts and the beautiful beaches are also worth mentioning. Weather in Slovenia is favorable and may differ according to the regions. By the Adriatic, the sun may be heating you while in the north, in the foothills of the Alps, the climate may be harsh. The composition of the nature and the history, the warm-hearted, friendly people, high standards of living and the peaceful environment. Discovering Slovenia, will add so much inspiration to your life. Get ready to feel love in Slovenia! 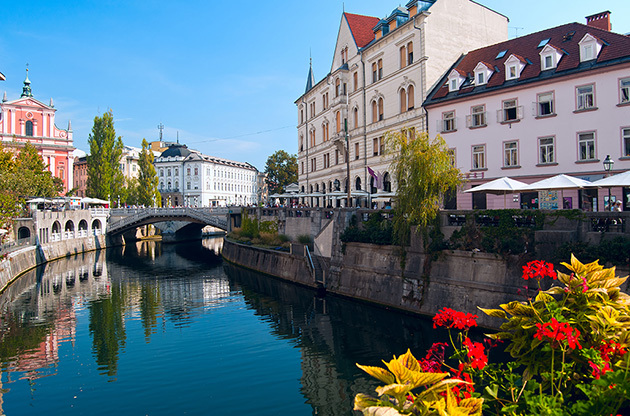 Slovenia, whose capital city Ljubljana, is located in central Europe bordering Italy, Austria, Croatia and Hungary. Surrounded by the mountains, Lake Bled is located only 55 km away from Ljubljana and in the north-western part of the country. There is an island in the middle of the lake that belongs to Vatican. You can stay up a few days in this area and Villa Bled would be the perfect choice since it was the residence of Tito, the founder and the leader of Yugoslavia. Do not skip viewing the lake from Bled Castle. Located approximately 120 km away from Ljubljana, Portoroz, one of the most touristic area in Slovenia, is situated southwestern part of the country. Known as “the Saint Tropez of Slovenia”, Portoroz deserves this epithet thanks to the beautiful beaches and the exciting nightlife. In addition, the biggest cave of Europe, Postojna Cave is located in this area where you can see Proteus, a species that is unique only to this cave. Slovenia’s coastline is about 45 kilometers and offers diverse and stunning beauties. Piran, Izola and Koper have many historical artifacts from the middle ages to enchant you as well as their fascinating natural attractions. Simon’s Bay (Simonov Zaliv) is the place where all the touristic hotels, restaurants and the swimming destinations are located. Being a historical zone, Piran is an old port area that is under protection and gives you the epitome of Mediterranean spirit. A yeasted type of pastry that is filled with walnut and tahina. Another type of pastry that is unique to the country. The most delicious kind of famous thick soups of Slovenia. A traditional food that resembles ravioli and filled with minced meat or vegetable. It is a widely popular frog leg dish. A distilled alcoholic drink that is made of Damson plums. Slovenia is a Schengen country and the visa regulations for Schengen countries are applied. If you still need to be sure whether you need a visa or not, the official website of Slovenia Ministry of Foreign Affairs will help you. With the enviable nature, high standards of living and the central location in Europe, Slovenia remains as an ideal host city for international events like symposiums, fairs, exhibitions, tradeshows, congresses and conferences. Diverse attractions of the city, world class hotels and convention venues, favorable climate, outstanding cuisine and the warm-hearted people… All of them collaborates to make Slovenia a matchless city for these kinds of events.